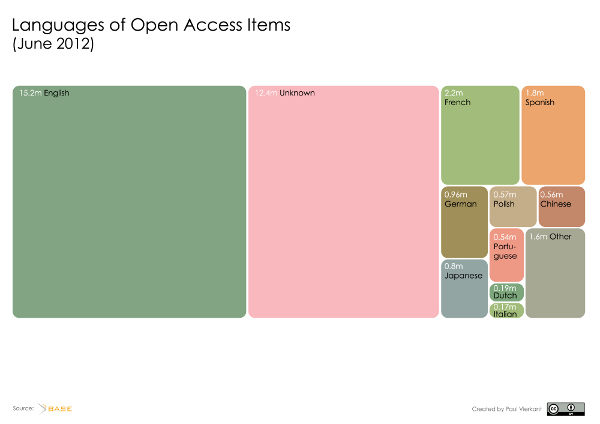 The treemap visualizes the origin of Open Access items [Fn 01] indexed in the Bielefeld Academic Search Engine (BASE) [Fn 02] on June 27th, 2012. [Fn 03] It shows the continents Europe, Asia, the Americas (North and South America), Oceania, Africa as well as International Organizations highlighting leading countries of each continent. The dominance of the United States of America providing as many Open Access items as Europe and Asia together becomes clear. Pointing out the small amount of Open Access items from Africa the visualization proves that the digital divide is also true for Open Access. The visualization shows the total growth of Open Access items [Fn 05] indexed in the Bielefeld Academic Search Engine (BASE) [Fn 06] from September 2004 until May 2012. 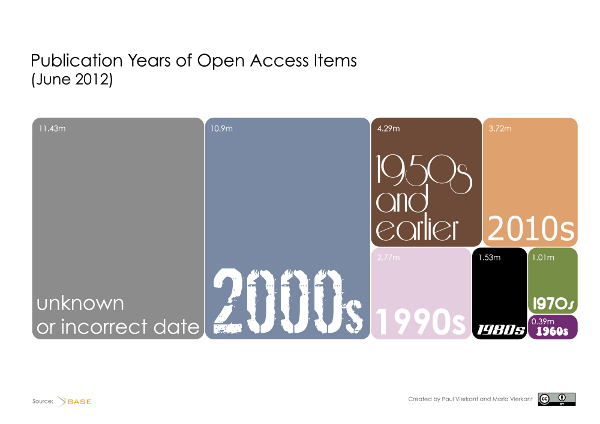 The graphic illustrates the amount of Open Access items by relating it to the size of a square. The square on the left depicts the size when BASE started its service in September 2004 with about 680.000 Open Access items. The second square shows the average growth of Open Acess items in the period from September 2004 to May 2012. The last and largest square shows the amount of Open Access items in May 2012. Comparing the squares the enormous growth of Open Access items in the last eight years is visible. The size of the square of the average growth reflects this development as it is almost large as the entire amount of Open Access items indexed back in 2004. The bubble chart shows the subjects [Fn 08] of Open Access items [Fn 09] indexed in the Bielefeld Academic Search Engine (BASE) [Fn 10] on July 5th, 2012. 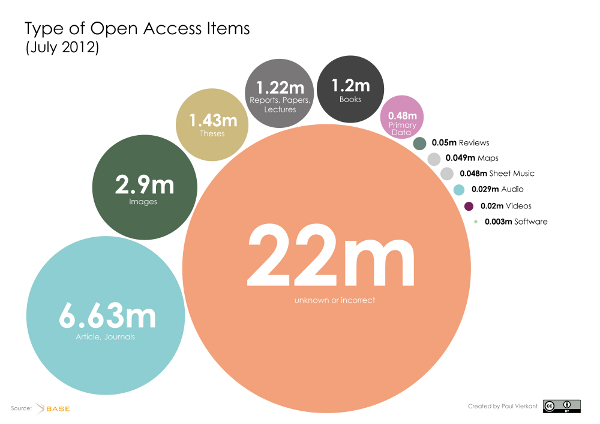 The visualization illustrates the amount of Open Access items classified according to the main class level of the DDC [Fn 11] relating it to the size of a bubble. Beyond merely giving an overview of the distribution of the subjects the graphic shows that the major part of Open Access items is not or incorrectly classified, deteriorating findability and visibility. This lack of information points out the need of proper and compliant metadata of publications and research data. The treemap shows the years of publications of Open Access items [Fn 14] indexed in the Bielefeld Academic Search Engine (BASE) [Fn 15] on June 22nd, 2012. Publications years are summarized in decades. The decades range from 1950s and earlier until the 2010s. The increase of published items throughout the decades is clearly visible. The visualization also reveals that the publication date of almost one third of all items is either unknown or incorrect, deteriorating findability and visibility. This lack of information stresses the need of proper and compliant metadata of publications and research data. 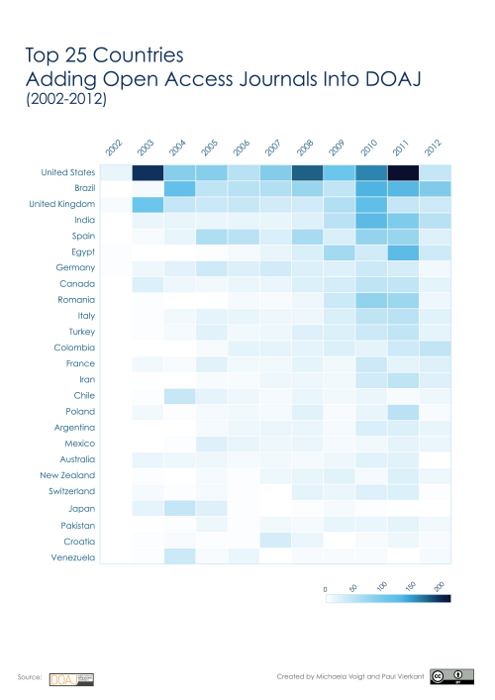 The heatmap shows the number of journals added to DOAJ from 2002 until July, 2012 by the top 25 countries. [Fn 18] The rows indicate the countries with the ones contributing the most at the top of the map. [Fn 19] The columns represent the years in which the journals where added to DOAJ. The darker a cell is the more journals were added in that year. There is no constant growth of Open Access journals visible, as for example the United States had peaks in 2003 and 2008. Interestingly enough, countries such as Brazil, India and Egypt are ranked higher than most European countries with strong Open Access movements. The bubble chart shows the type [Fn 23] of Open Access items [Fn 24] indexed in the Bielefeld Academic Search Engine (BASE) [Fn 25] on July 5th, 2012. 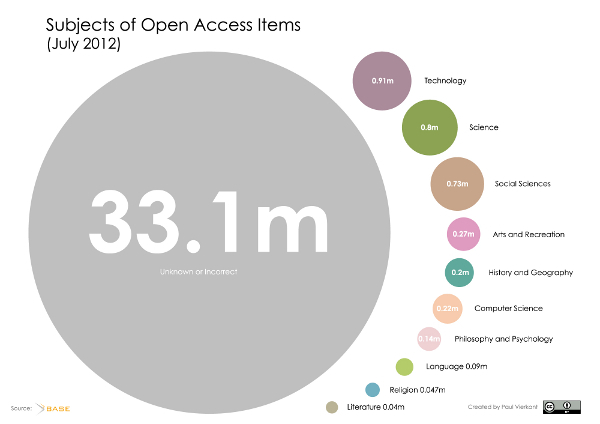 The chart visualizes the amount of Open Access items according to their type relating it to the size of a bubble. Beyond merely giving an overview of the distribution of the document types the graphic reveals that the document type of almost two thirds of all Open Access items is unkown or incorrect, deteriorating findability and visibility. This lack of information stresses the need of proper and compliant metadata of publications and research data. 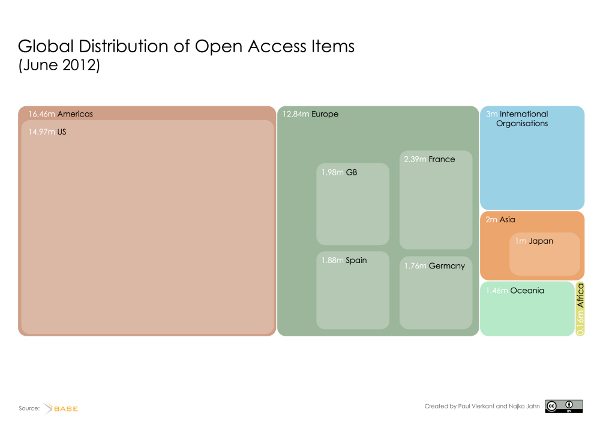 The treemap shows the languages of Open Access items [Fn 28] indexed in the Bielefeld Academic Search Engine (BASE) [Fn 29] on June 22nd, 2012. With about 40% of English Open Access items the visualization supports the assumption that in most countries English is the language of science. However the graphic illustrates that the language of more than one third of all items is unknown, deteriorating findability and visibility. This lack of information stresses the need of proper and compliant metadata of publications and research data. 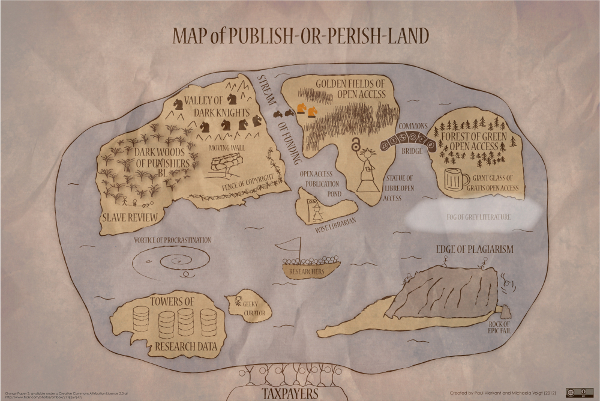 The map depicts the current situation of researchers being forced to publish or to perish. Focusing on electronic and Open Access publishing, the map is meant to visualize in an ironic manner the different paths researchers can take when being confronted with the question how and where to publish their works. Paul Vierkant ist an der Humboldt-Universität zu Berlin als Mitarbeiter im DFG-Projekt re3data.org tätig, das den Aufbau eines Verzeichnisses für Forschungsdatenrepositorien zum Ziel hat. Vorher war Paul Vierkant bei der Bibliothek der Universität Konstanz als Projektkoordinator ebenfalls zweier DFG-Projekte (Verknüpfung von Fach- und institutionellen Repositorien; Aufbau einer virtuellen Forschungsumgebung) beschäftigt.